The White House Christmas tree has been delivered! The Obama family shifted into Christmas gear Friday afternoon as the traditional horse-drawn wagon hauled in an 18 ½ foot Douglas fir, grown on a family’s farm in Lehighton, Pennsylvania. Christopher Botek, the farm owner, brought his wife and two daughters to the White House as he presented this tree to the Obama family. He said he was honored to hand over the tree, caring on tradition, as his parents had presented the official White House Christmas tree from the same farm in 2006 during the George W. Bush administration. As the military band played the Christmas carol “O Christmas Tree,” Michelle Obama, and her two daughters, Sasha and Malia, were outside to receive the tree this year. Check out the video of the ceremony below. For this occasion, Malia Obama was dressed in skinny pants, a green blouse and black print blazer. Sasha, on the other hand, wore plaid tights paired with gray shorts, a gray and white striped blouse and black blazer. Do you like this mixture of patterns in Sasha’s outfit? While her daughters dressed in these trendy fashions, Michelle went for a more classic look. 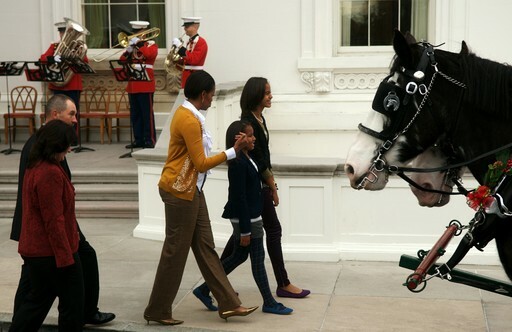 Mrs. Obama was dressed camel trousers and a white, ruffled blouse gold Merino sequin crochet cardigan from J. Crew (available here.) While the 3 Obama women wore drastically different styles, all opted to wear the ever so classic ballet flats with their ensembles. Do you think a love for fashion runs in the family? President Obama, First Lady Michelle Obama and their two daughters, Sasha and Malia, attended a church service Sunday morning at St.John’s Episcopal Church in Washington, D.C. Luckily, the President had no public events scheduled for the day! For this occasion, Michelle chose to wear a bright, floral Thakoon dress. Completing her ensemble, Mrs. Obama accessorized with a double strand of pearls, soft green pumps and covered up with a beige. Sasha and Malia each wore a sundress paired with a cardigan, and President Obama wore a fashionable suit with a double-button sport jacket, in the style popularized by JFK in the early 60’s. I wonder if Mrs. Obama helped dress her daughters this morning? This style of sundress paired with a cardigan has “Michelle” written all over it. However, the cardigan, a look popularized by the first lady in 2009, is the perfect cover-up for a sun dress at this time of year; the girls look great! Michelle, on the other hand, what was she thinking? Newsflash! It’s September now and our summer colors are back in the closet. In my opinion, this dress is too bright and flowery for this time of year, but to each his own, I suppose. How do you think the first family looks? Fashionably correct?